Director Woo Sung Lee of Korean Cultural Service NY attended the Taekwondo Association of Greater New York’s New Years Taekwondo Athletes Appreciation Night to encourage 160 athletes with their endeavors to learn and practice Taekwondo. 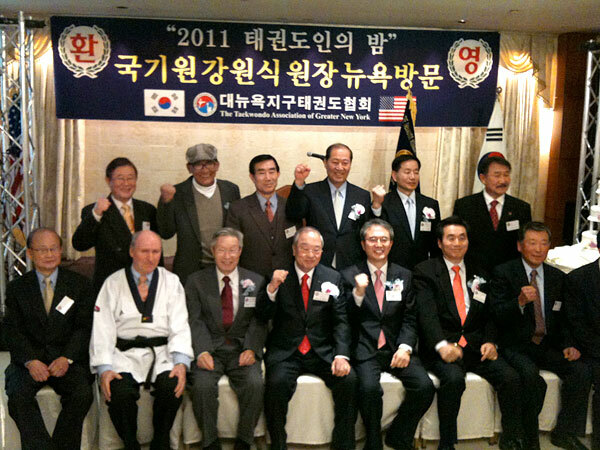 World Taekwondo Headquarters’director Won Sik Kang, the vice president of University of Bridgeport, Palisades Park municipal mayor Jong Chul Lee, and Ambassador Young Mok Kim were present at this event. Through the New Years Taekwondo Athletes Appreciation Night, networks between Taekwondo athletes were strengthened once more and information on Taekwondo practices and efficiencies were exchanged to advance and heighten the role of Taekwondo in America. In addition, the event provided the opportunity for the Taekwondo Association of Greater New York to establish a more collaborative bond with the World Taekwondo Headquarters to receive curriculum on intricate Taekwondo techniques and applications.